That tweet is by Sheree Van Vreede (@rezlady) of IT Tech Exec. She was offering her advice to interviewed candidates and how they should write their “thank you” note post-interview. A “Thank you” should be just that, nothing else. Her words struck a chord in me that I could not shake. Time and time again I see businesses, especially yarn shops, who send newsletters “thanking” their customers, but immediately go into a full-out sales pitch of things to buy. Every time I see these newsletters in my inbox, I cringe then ask myself as I roll my eyes, “So what are they selling NOW?” What makes these newsletters so shamefully sales-oriented is that a number of them begin with a “Thank you for being a customer” then immediately go to a “Come in and buy THIS and THAT and THOSE” attitude. What would I do if a business were to have a genuine “thank you” without selling anything? I would definitely be more inclined to visit the shop and buy from it. So does that mean I do not like newsletters? On the contrary of what you may think, I do. My favorites that I look forward to reading are from Christopher S. Penn and Food52. Both offer different aspects to my needs. Christopher S. Penn offers a synopsis of what I may have missed in his daily 5 and podcasts. Food52 gives me a teaser on various topics with a brief description and beautiful photos. Both newsletters do what they are supposed to do — drive me to their websites so that I can get more information to pique my curiosity. 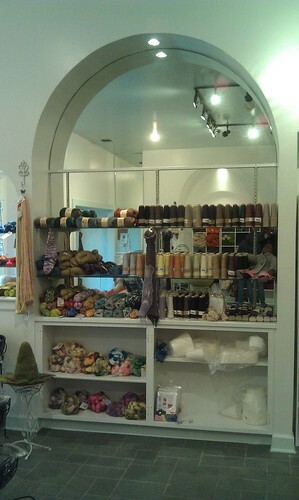 Wyrd Sisters Yarn -- A Welcoming Place for Crafty Folks. Click the photo to be taken to their website. Interestingly, there is a yarn shop owner who is genuine in her reach to all of her customers. Cate Leonard of “Wyrd Sisters Yarn” in Roanoke, VA shares personal triumphs and yet can still offer product news without portraying the “slimy salesperson” persona. Though I built Cate’s website and have tweaked her shop’s Ravelry page — all her website, Ravelry, and Facebook posts and her newsletters are genuinely from her heart. I have the feeling part of it comes from her being an anthropologist and cancer warrior, but I also know that Cate is the real deal. She is one of the people who inspire me and many others in our fibery cut-throat industry.